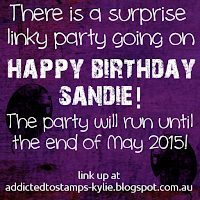 Today is Sandie Munro's birthday (London Days) and Kylie (Addicted to CAS) is hosting a birthday linky party for her! Sandie is such a sweetheart and bloggie friend. We connected online a couple years ago when we were both new to blogging. Sandie I hope that you have a fabulous day today and that you enjoy your linky party. Have cupcake for me please! The link up for Sandie's party is HERE on the Addicted to CAS blog and runs until the end of May! Here is my card for Sandie and I used today's new sketch for RetroSketches! 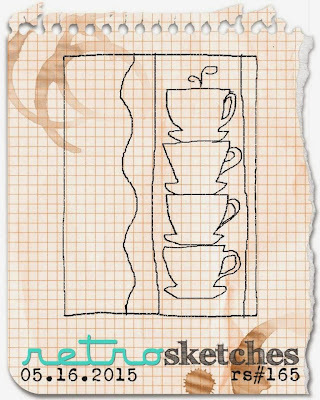 This week's sketch is based on THIS card that I create for the last Coffee Lover's Bloghop. 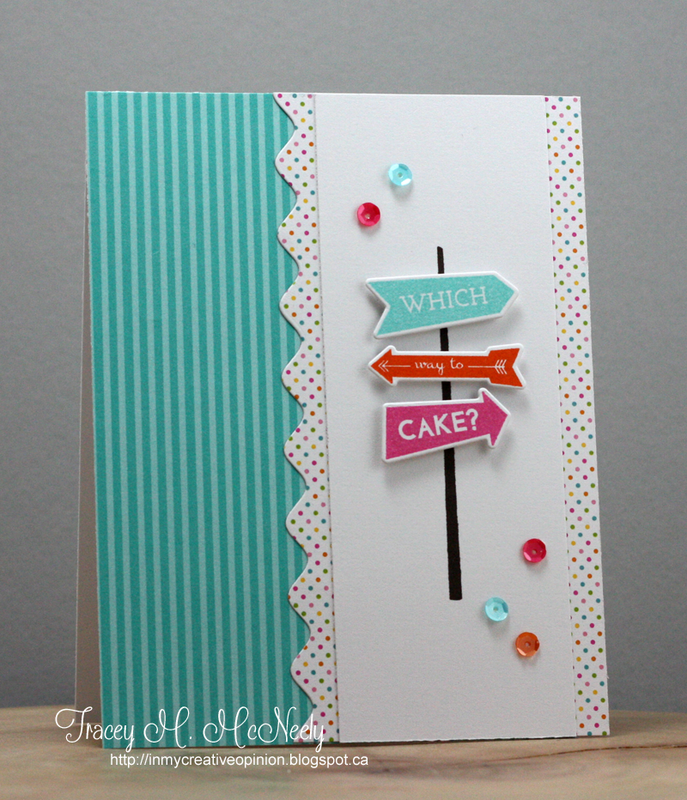 This time I put a birthday spin on it using the sign from Papertrey Ink's RetroStyle Birthday stamps and dies along with some fun patterned paper. Hope that you join Sandie's linky party and that you play along at RetroSkethes this week! EEP! I love the sign post sentiment! Super cute and fun card, Tracey. Love this Tracey! The colors are fabulous! LOVE this so much, Tracey! Great use of your papers and that stamp/die set! Such a sweet Birthday card! I am sure she will love it!!! And those cupcakes look yummy too! What a FUN card, Tracey! Here is another perfect card accentuating the fact that I don't have that set YET! So, so pretty, Tracey! Sandie will love it, and the cupcakes! Absolutely adorable card Tracey! Love the colors and the sequins!! I'd like one of those cupcakes too! Great birthday card! Tracey--this is so fun, sweet and gorgeous. Love it so very much. I have a card I made earlier this week that I was planning on posting today--using the same set, but totally different. Love that cute pattern paper border you used. And, of course, those signs. I love the colours and bold look of this card! Not to mention how perfectly your sequins match the inks and papers. LOL! That's a fun birthday card! Simply fabulous card and I am still waiting for my cupcake to be delivered! Super fun! Love the polka dots and stripes, and the color here is TOO FUN! I love everything about this card, Tracey. The design, the paper, those darling signs. So fun and creative. Gorgeous card, Tracey! I love the color combo and the striped panel is fabulous with those sweet polka dots! Love the retro sign post, too! Perfect birthday card for Sandie! I also want to say thank you so much for your condolences...it was so sweet of you! 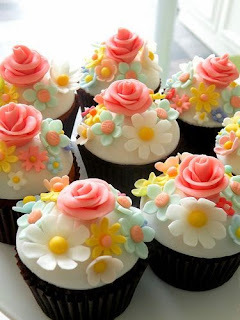 Oh, and I LOVE your beautiful cupcakes...they look so yummy! Oh yeah, point me to the cake!! This is adorable, love the polka dots and fun little signs! Love your card Tracey! The colors are lovely and your take on the sketch is fabulous! Definitely a fun one!! Love this, Tracey! The colors are so wonderful and the sentiment on the directional sign couldn't be cuter! I love this card a million times and then some! 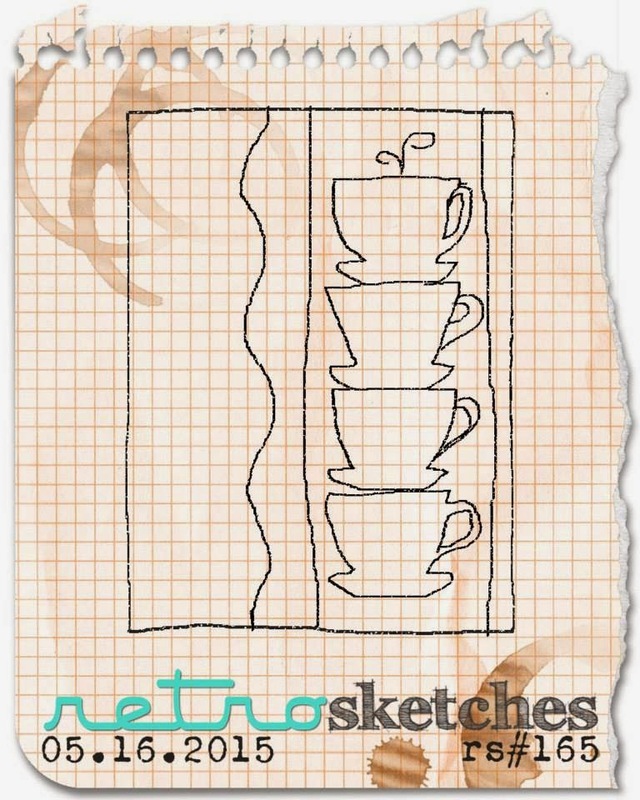 I saw this on the retro sketches blog and this was my favorite. I LOVE everything about it!! 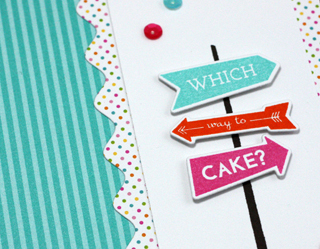 Fresh, fun and fabulous, Tracy...your papers are the perfect accompaniment for the 'street sign'! By the way, which way *is* it to the cake? Once I'm home, I'm digging out a cake recipe...you've sparked a craving!